Ramos Arizpe and San Luis de La Paz tie for my least favourite Mexican towns – they are noisy and messy and I can’t wait to get out. SLdLP at least has the redeeming feature that Hotel Parras had improved significantly when we visited last March compared to April 2011. So we made for the hotel with some optimism, only to be disappointed to learn that there were no vacancies. A monument in the reception area suggested that the husband of the lady who had appeared to run the hotel may have died. Very sorry. So on to Hotel San Juan next door, where a minivan with American Mexicans were just ‘down loading’ all their luggage – no sorry – full up! There are 6 hotels recognised by SatNav, plus one Motel, which we chose to ignore. Some of these were closed and the others turned out to be hostals with shared bathroom and toilet facilities – no thanks. With daylight fading fast we drove the 26 km south to San Jose Iturbide that claimed to have four hotels and which appears to be much quieter and less noisy, with beds found at Hotel Rhodes. We missed the nice restaurant after stuffing ourselves with savoury torts – kind of bread rolls with bacon, cheese and pineapple – a sort of ‘pizza in a roll’. Bart and Alain had managed to find a liqor store where more Chilean wine was purchased together with some beer and the nasty cane sugar alcohol that Alain, Cliff and Ian used to drink with Coca Cola, a diabetic nightmare! Still, we have another visit to Turbinicarpus alonsoii to look forward to tomorrow. But back to today. We said goodbye to ‘the other car’ – Ian and Sarda Woolnough and Cliff Thompson, who were driving back to Vizarron today for a drive to the airport on Wednesday for their flight home. Let’s hope that Cliff manages to change his flight, as he was supposed to be on my flight on Saturday night. We must have followed the same road south, but some time apart, as we also came across the turned over truck mentioned in Ian’s report, also managing to squeeze past. Soon afterwards the traffic seemed to dry up behind us, so perhaps they decided to close the road to let the emergency services through. We too took the road to Penamiller, but then carried on and found a better than expected road to San Luis de La Paz. I recorded three stops – one for a collection of topes (sleeping policemen) signs and then the video of us approaching, slowing down and crossing the hump. The second was a pitstop along the road where Agave attenuata was growing from the rocks alongside the road, as well as a probable Echeveria (S3210) and S3211 was made to encourage us to stretch our legs, with my back now nicely ceased up. 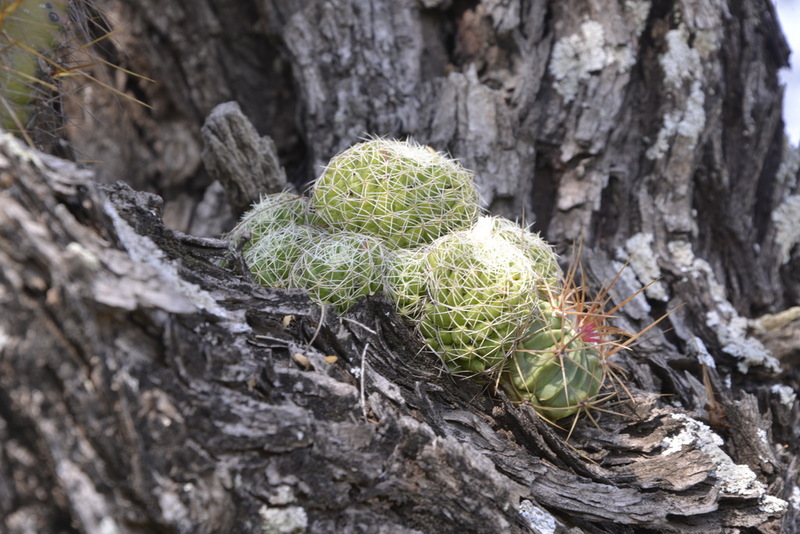 Not a huge amount of cacti to boast about except a little cactus garden growing epiphytically on a tree trunk. If anyone can identify the Mammillaria ……. 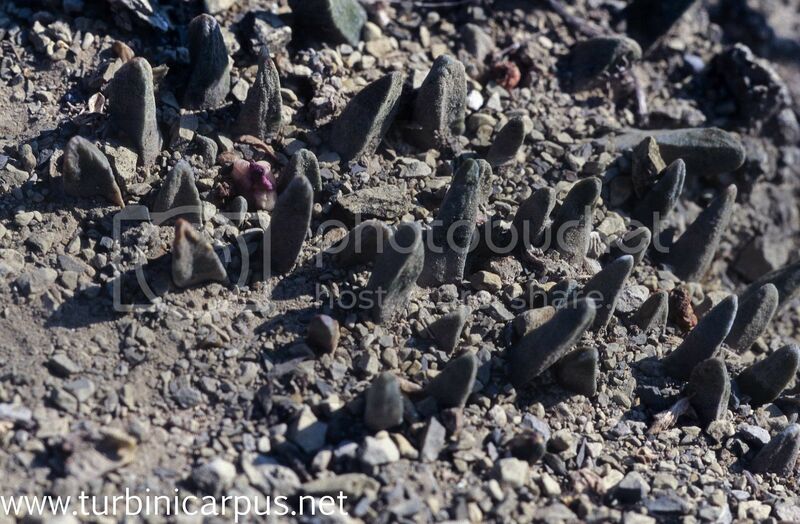 (just one response, thanks to Juergen Menzel who suggested Mammillaria decipiens subsp camptotricha. That looks like Dolichothele campotricha. But don’t know if it native there.